Even though Rioja primarily produces reds, it wasn’t always so. The Najerilla river valley, known for its pink wines, provides a fascinating glimpse of Rioja’s history and current winemaking techniques. Rioja actually produces two styles of pink wines: rosado and clarete. At first glance, the difference is merely color, with rosado a medium reddish pink and clarete a very pale orange. However, the two styles are made differently. Rosados are vinified like whites, except for short contact with the skins to extract a little color, while clarets are vinified like reds, with red and white grapes fermented together with the skins. 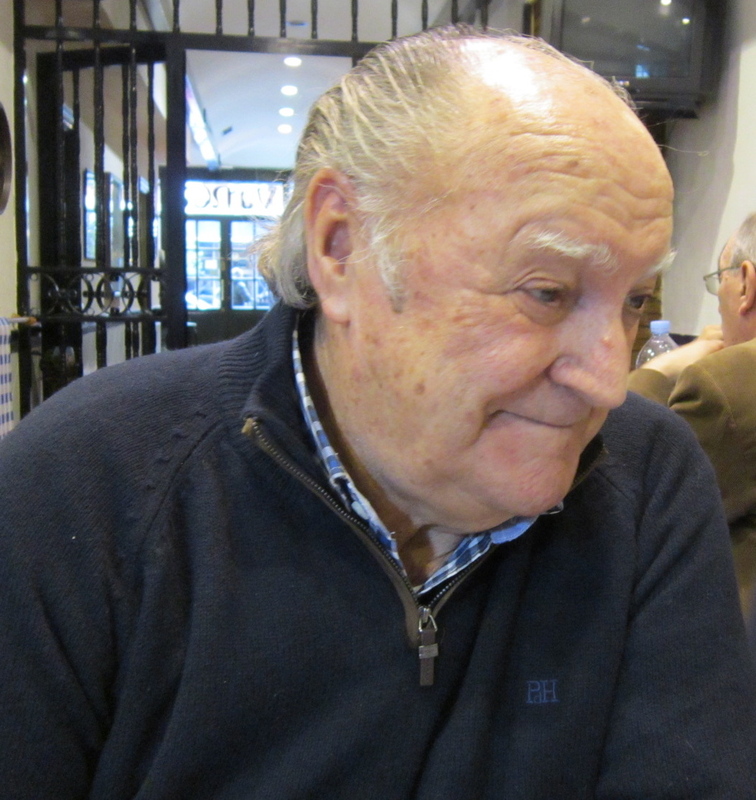 According to Ezequiel García, El Brujo , the legendary 82-year old former winemaker at CVNE and Bodegas Olarra, the name clarete comes from the fact that in Rioja Alta and Alavesa there were traditionally more white grapes than red and both colors were found in the same vineyard. When a particular vineyard was harvested, both the red and white grapes were dumped into open lagos or closed vats and fermented with the skins. The fermented juice was a pale red, called clarete. 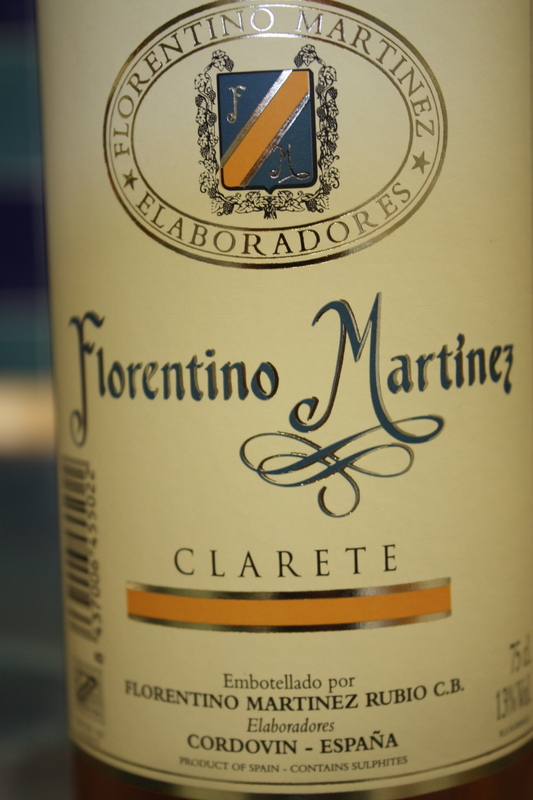 CVNE used to label this red wine as clarete. I’m not sure, but perhaps the British term for red Bordeaux – claret – coming from the French clairet has a similar origin, although today, claret refers to red Bordeaux and clarete in Rioja, to a very pale, orange tinted rosé. This color is referred to as ‘ojo de gallo’ or rooster eye. While production of rosado is larger than clarete in Rioja, the latter has quite a following, especially in northern Spain. In Bilbao, people often ask for ‘un cordovin’ referring to the village in the Najerilla valley where much of Rioja’s clarete is produced. Other well-known clarete villages are Badarán, Cárdenas, Azofra and Hormilla. San Asensio however is the best-known place for clarete and the town even celebrates a clarete battle near the end of July. Clarete was traditionally made with the white varietal viura and the red garnacha, a variety that used to be abundant in the valley. One of the claretes I saw in a wine shop, from Hormilla, had 70% viura, 20% tempranillo and 10% garnacha. Rosado, on the other hand, is almost always a blend of red varietals: in Rioja, tempranillo and garnacha, or 100% tempranillo. The regulations of the Rioja DOC require that at least 25% of a rosé or clarete blend must be made from red grape varieties so a clarete could have as much as 75% white juice. Left, a Rioja rosé. Center and right, claretes. The clarete style is gaining popularity. Several producers are labeling their wines as such, a surprise to me because I didn’t think the name was officially allowed by the Rioja Regulatory Council, but since the end of 2011, it is. I was also surprised to see a bottle of Muga rosé with a much paler pink color than in the past. 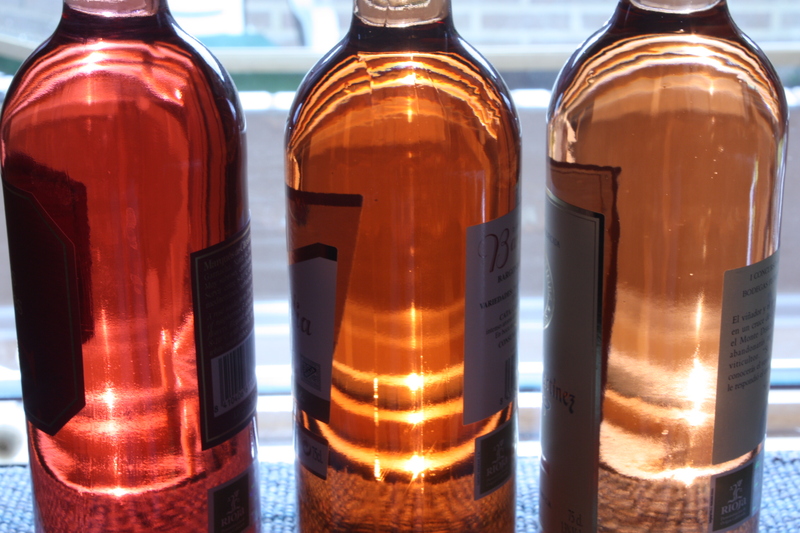 Maybe clarete or at least pale orange-tinted rosés have an international future.